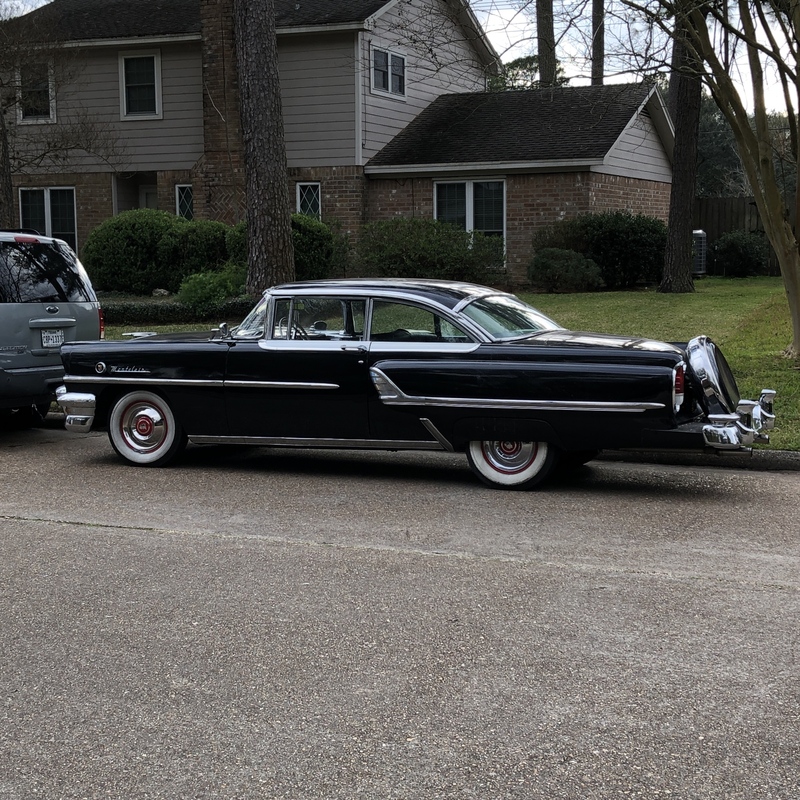 I pulled up to my folks house today and this '56 Montclair was parked across the street. My immediate thought was "Man, I'll bet RM would dig this." Get out of my head, Roadmaster! You are correct sir, that is one sweet ride! That looks like my old house on Trace Forest Dr, in Memorial Northwest. Many of the houses there are similar in appearance. Nice car btw. This neighborhood and MNW were built about the same time. Only about three miles apart. Well the pt cruiser is back together again. Overhauled the engine last year new pistons, rings, bearings, rebuilt cyl head, oil pump. Water pump, new turbo. Was using oil bad, I broke an oil ring separator so. Pulled #2 piston replaced the rings. Everything was fine for 30k miles. Then started kicking front crank seal out of oil pump. Tried new oil pump didn't work. Pulled engine 3 weeks ago to replace crank and bearings. It had worn the thrust bearing and the crank out. Got the engine back in a couple weeks ago, then snow, lol. Finished it up today. The only thing I can figure is that when I broke the oil control ring separator on number 2 piston and was using so much oil that's when the damage started. Just worn more as the miles racked up. I drive 120 miles round trip a day to work. It's back on the road. It's an 2005 PT gt with 230,000 miles on it now. Still cheaper than buying a new car. Especially when still paying on my wife's 2014 compass. A cat that lived somewhere near Branson had a Mercury like this one only it was painted kinda a reddish orange color. Bright side is you can now pull the engine out of a 2005 PT Cruiser in 35 minutes, in your sleep. 15 year old Son1: Dad, can you give me money to visit South Coast Gymnasium tonight, then take me? Thunktank: If you wash and wax my car inside and out really well today, sure. So off he goes for 1.5 hours to clean my car while I kick back and watch a ball game. I can’t understand why some parents don’t like teenagers. He did a nice job too! I taught him long ago about attention to detail. Yes the trans has 231000 miles on it. The fluid has been changed every 60k miles or close to that, never been rebuilt. now I need to buy 2 more wheels, chrome plated aluminum is crap. looking for 2 more SRT-4 wheels. Had a blow out on the way home tonight. Judy and I went to pick it from work after Church today. My nephew has an '01, 150000 mi, good shape and good engine, but the transmission went out. I didn't get the whole story, but I think an internal filter plugged and gears got starved for fluid. He listed it for $500 and got no offers, so now he's decided to search for a replacement transmission. Might be worth a call to the transmission shops to source a rebuilt one. Junkyard trannies are a crap shoot. A rebuilt job is probably $1200 vs $200-300, but if you're going to the trouble to swap it, it's money well spent. Of course I say this as a geezer who spent plenty of time scrounging junk yards when he was young and broke so I know the appeal of the cheap ones. Daughter #1 had a PT for a while. The DCX transmission was crap. JB Weld wins assuming this is not rigged. It didn't look like a rigged test to me. Not apples to apples because the products are very different, but not rigged. JB Weld is more useful than duct tape. Every tool box and bag I own has tubes of that stuff in it. I've used it to rebuild missing tabs on aluminum thermostat housings and cast alternators on engines before. I have a pipe stem I repaired with it. Durable, yet unconvincing. As most of my stuff is old I have used my share of the stuff also. Last week, I replaced a hose on my wife's Jeep. It took me nearly an hour. In doing so, I cracked my knee cap, received a vicious cut on one hand, and was drenched in anti-freeze. Mrs. UB told me that although I could do a lot of things we should mark off "auto mechanics" from the list. There may have been cussing. Maybe. Oh dang, that's real pain right there. JB Weld might work on knee caps. WD-40 for the cut followed by duct tape.